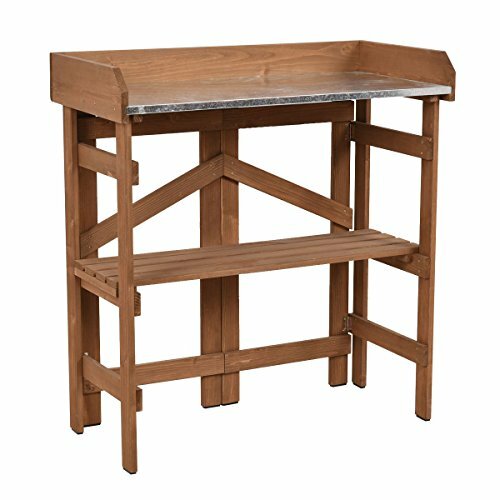 Wooden Potting Bench Garden Planting Workstation Shelves by billionese at The Net Stores Network. Hurry! Limited time offer. Offer valid only while supplies last. Description This is our new potting bench. The simple design of this potting bench makes it look compact. And it is made of wood, which is natural. This is our new potting bench. The simple design of this potting bench makes it look compact. And it is made of wood, which is natural. Its wooden construction and a metal top makes it sturdy and durable. It also has a useful shelf. You have enough space to put your potting. If you own this potting bench, it will sure to be a great display of your garden. You will feel delightful after having this potting bench. Whenever you walk into the garden, the potting bench can bring you a wonderful sight experience. So don’t hesitate! Come and buy one! Distance from lower shelf to ground: 16.1"
If you have any questions about this product by billionese, contact us by completing and submitting the form below. If you are looking for a specif part number, please include it with your message. Raised Garden Bed Potting Bench Work Station Plant Storage Shelf 35" x 22"